I'm trying to connect a phone to a laptop and record two-way the audio. For now i'm using Windows with my own software, and using https://www.vb-audio.com/Cable to forward some audio channels. With my software (simple Node.js) I record all incoming / outgoing audio. And its also possible to listen to a live stream with a browser. After a while I had a lot of resound. Also putting the mic and audio out on the same line in is not an option I think. I have to stick to Windows for the user, but I also tried ofone with bluetooth. It did not work out of the box, and it look like it will break sometime. Also googled for Bluetooth HFP (Hands free Profile) under Windows 10 but it's not supported. Is there some simple (out of the box) hardware for this situation? I would like to keep it small and connect it to a laptop. I believe this can be done with virtual audio cables, but I am not in a position to test this. With your virtual audio cable, you need to split these audio "streams" and route them to your custom software for recording/streaming. How exactly in detail you do this, you need to figure out, as it is impossible to see on what interfaces this comes in, and therefor impossible to detail here in an answer. Not the answer you're looking for? 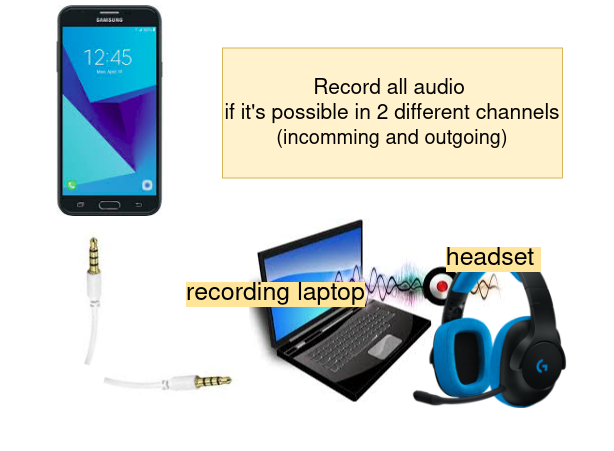 Browse other questions tagged audio-recording laptop phone or ask your own question. What equipment do I need to record the audio from my piano keyboard? how to record two sources into a single audio file in Linux? How can I clean up my laptop's sound card input? Mid-range external sound card recommendations. How to hook up my Win XP laptop (w/ Audacity) to a cafe's Mackie 1604 soundboard? How to record individual tracks through it?